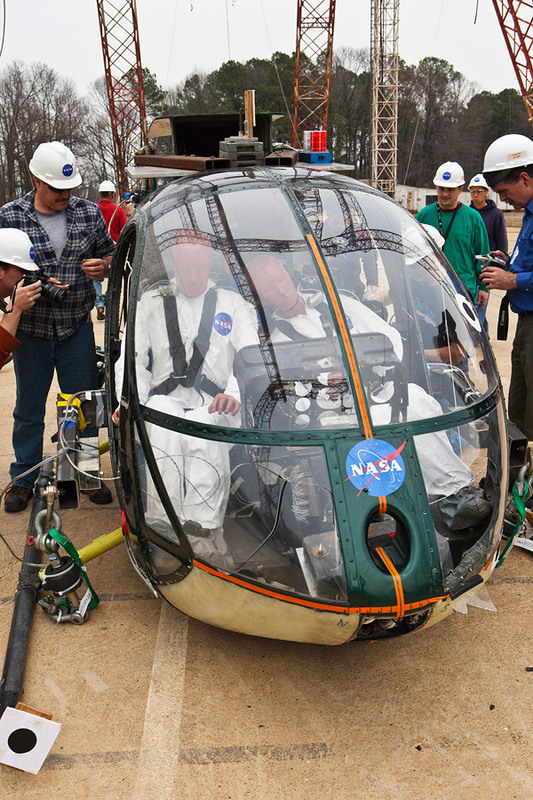 The second crash test of a small lightweight helicopter at NASA's Langley Research Center in Hampton, Va., was a smashing success, literally -- just as engineers had predicted. "Three, two, one, release," said the technician on the loudspeaker at the Landing and Impact Research Facility. With that countdown the helicopter smacked hard into the concrete. Its skid gear collapsed, its windscreen cracked open and its occupants lurched forward violently, suffering potentially spine-crushing injuries according to internal data recorders. The crash test was all in the name of research to try to make helicopters safer. "The goal of any research program that has an element of impact dynamics is to develop an understanding of the crash response of the vehicle," said Karen Jackson, an aerospace engineer who oversaw the test. "Once we understand that response we can look at ways to improve the crash performance." 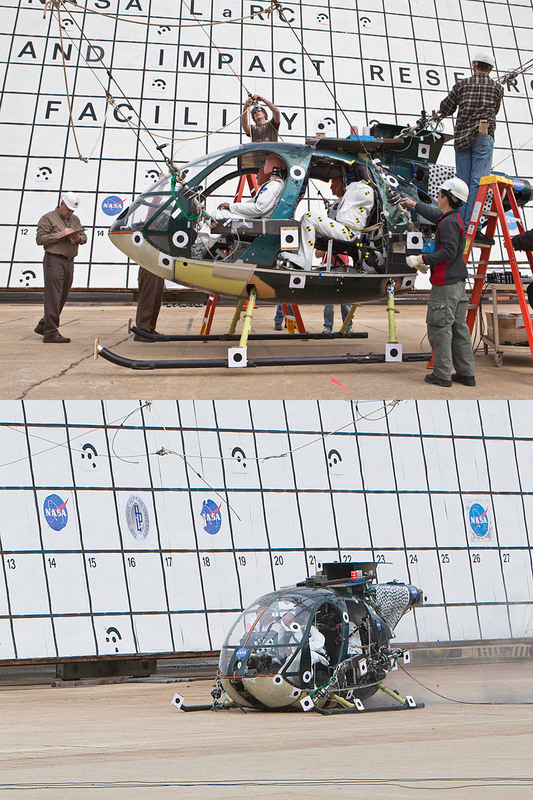 In December 2009 researchers dropped the same MD-500 at a similar angle from the same height of 35 feet (10.7 m). Inside were the same instruments that collected 160 channels of data and the same four crash test dummies. Three of the dummies were full bodies and one was a special torso model equipped with simulated internal organs. Technicians set up the same cameras to record the impact from inside and outside the helicopter. The test conditions on both days were the same too, simulating what would be a relatively severe but survivable helicopter crash. The flight path angle was about 33 degrees and the combined forward and vertical speeds were about 48 feet per second or 33 miles per hour (53.1 kph). In the first test the MD-500 skidded to a stop, with very little damage to the helicopter or its silent occupants, because its underside was outfitted with an expandable honeycomb cushion called a deployable energy absorber. "It's made of Kevlar and has a unique flexible hinge design that allows the honeycomb to be packaged and remain flat until needed," said Sotiris Kellas, the Langley engineer who created the idea as a way to cushion the next generation of astronaut-carrying space capsules, but realized it could be used in other ways. The more recent drop on March 10, 2010 involved just the helicopter. No new technology was attached. That was the point. Engineers wanted to determine exactly how efficient the deployable energy absorber had been in the earlier test and how much it might help reduce occupant injuries. So they dropped the same helicopter in the same way and measured and recorded the same conditions with the same instruments. "We were fortunate enough that the helicopter survived so well the first time that we could use it again," said engineer Martin Annett. There will be no third crash test for this helicopter. It was too damaged. Researchers say the "g" forces the MD-500 experienced more than tripled those recorded in the previous test. But that doesn't mean the research is over. Engineers have gigabytes of data to analyze to confirm exactly what impact the new honeycomb cushion technology might have for helicopters in the future. The drop tests were conducted by the Subsonic Rotary Wing Project of NASA's Fundamental Aeronautics Program, and funded by the agency's Aeronautics Research Mission Directorate in Washington. The MD-500 before and after the drop test. The force of the impact shattered the MD-500's windscreen.